Pretty shower curtain with vibrant colors. Nice weight to the curtain so it hangs nicely and washes well. There are several shades of blue and coral so coordinating towels and accessories is easy. This user was entered into a sweepstakes after submitting their honest review. 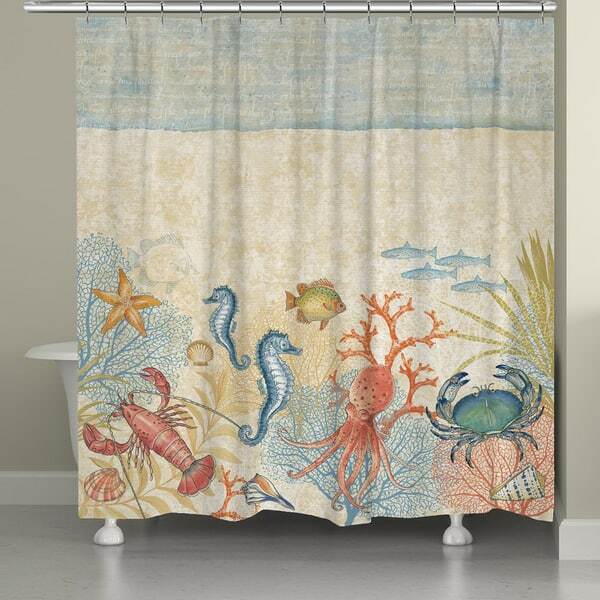 Showcase your love of all things nautical with this coral and blue hued shower curtain featuring plenty of sea creatures. A softly textured background contrasts with crisply detailed crustaceans and plants to give you a vivid bathroom accent. Pretty shower curtain with vibrant colors. Nice weight to the curtain so it hangs nicely and washes well. There are several shades of blue and coral so coordinating towels and accessories is easy. Shower curtains are an essential element to any bathroom with a tub or shower stall. Whether you wish to update the look of your decor or simply want something reliable to repel moisture and also keep water off your bathroom tile, the ideal shower curtain should be both functional and attractive. This guide will help you narrow down your options so you can choose a curtain that suits your particular needs. Tips on Using Cloth Shower Curtains from Overstock.com. Our guides provide customers with tips on using cloth shower curtains. How to Clean a Vinyl Shower Curtain from Overstock.com. Here's how to clean and maintain your vinyl shower curtain. How to Clean a Cloth Shower Curtain from Overstock.com. Is your cloth shower curtain getting mildewy? Here's how to clean it. How to Install a Shower Curtain from Overstock.com. We're here to help with your new shower curtain.